ZHAW Service Engineering ICCLab sporadically sends Newsletters with short information about latest activities of the lab and relevant events. Athens hosted the annual Future Internet Assembly conference at Megaron Athens International Conference Centre on 18-20 March, where more than 400 European Internet scientific and economic actors, researchers, industrialists, SMEs, users, service and content provider representatives have attended, delivered new ideas, and shared views, aiming at advancing activities for reshaping the Future Internet. The themes of this year event went along new Internet technologies based on network/cloud integration & virtualization and innovative software, services and cloud technologies to enable the innovation of the applications. The presence of the Future Internet Public Partnership Programme, Twitter ) at FIA 2014 has been assured by dedicated sessions and by FI PPP project booths represented by relevant projects like XI-FI (ZHAW is partner), FI-WARE (ZHAW), FI-CONTENT2, FINESCE, FI-STAR and FITMAN. ICCLab node on XI-PI portal. 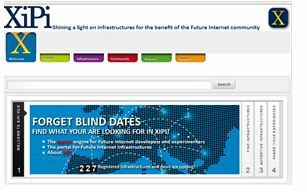 Within the activities of the project FI–PPP Infinity, last year it was created a dedicated portal to improve and facilitate the registration, discovery and uptake of the Future Internet experimental infrastructures, and to make it easier for Future Internet developers and experimenters to use the XiPi portal in order to find relevant infrastructures for their testing requirements. The datacentre of ZHAW ICClab, hosted at Equinix Zurich, is part of the XI-FI federation since 2014 and you can find all information on ICCLab node in this XI-PI portal. On 2-3 April 2014, the Future Internet PPP organised the 1st European Conference on the Future Internet (ECFI) in Brussels. This ha brought together key stakeholders to discuss how Europe can achieve global leadership in ICT by 2020 through innovative Internet technologies. ZHAW ICCLab was part of the event organisation as partners of the CONCORD project. Cloud Computing becomes more and more important. To get the full power of clouds in the view of /ch/open these clouds should be open according of the principles open cloud initiative. The goal is to foster open clouds and interoperability of clouds. Especially, taking into account the requirements of public administrations and SMEs. In this conference especially concrete stacks are discussed. In the afternoon are held specific workshops. The developments in Gov Clouds are also discussed. The conference builds on the success of two previous Open Cloud Days in 2012 and 2013. The event is planned as a full day event with a single track and 1-2 training session for specific cloud stacks. The themes will be: Clouds for Public Administration, Success Stories of implemented clouds, Details of Cloud Technology, Cloud interoperability, How to avoid/minimize lock-ins, Platform as a Service. The ICCLab is pleased to invite you to the upcoming Workshop on Scientific Computing in the ICCLab Cloud. This workshop will focus on how to leverage the ICCLab Cloud infrastructures for executing scientific applications in a distributed, high performance environment. The workshop’s agenda will include several talks describing applications from different areas of science (physics, mathematics, machine learning, etc. ), highlighting their requirements from the ICT perspective. The workshop will also include a comprehensive overview of Hadoop and a tutorial on how to deploy, configure and use a Hadoop cluster on the ICCLab Cloud through the Savanna OpenStack project. The workshop date and the full program are to be announced. The IEEE Transactions on Cloud Computing (TCC) is seeking original and innovative research papers in all areas related to Cloud computing. After the Kick-off meeting held in Jab 2014, the project is progressing with the definition of the use cases and scenarios as part of the WP2 activities. All these requirements and specification will be used as input for the architecture of the project. The project held its XIFI World Summit 2014 on 26-28 March in Zurich. One of the objective of the meeting was to start the inclusion of new partners as result of the open calls. ZHAW ICCLab is one of the new partners joining the consortium. Technical aspects, needed to include new data centers in the XI-FI federation, have been introduced as well as the project status and relevant deliverables. The project is progressing fast with the re-organisation of the supporting actions and FI-PPP governance model, as result of the phase-3 of the programme which has a major objective the marketization of the solutions and numerous open calls that will be issued by the new accelerator projects. From 27 January to 31 March, participants have submitted their ideas for the Smart Society Challenge or prototypes for FI-WARE Excellence.20. Selected teams for each challenge will receive a €2,800 prize and enter the final phase of the contest. During this phase a jury composed of FI-WARE platform developers and other experts will advise candidates on how to improve their prototypes before ultimately presenting their final versions. ZHAW is actively engaged in the GEYSER project which is focused on making urban Data Centres more energy efficient. One of the key aspects of the project is the relationship between the Smart City and the Data Centre: Data Centres can generate energy as well as be flexible with respect to energy consumption. For this reason they are particularly interesting players in an urban grid. The project had a meeting in ZHAW in February and is working through the requirements definition of the GEYSER system. A cloud-native application is drafted and designed to take full advantage of cloud platforms. The cloud-fication also identifies any application re-architecting or service to take advantage of cloud principles. The result of this process is a cloud-native target. Such targets have common behaviors and characteristics. A cloud-native application is assumed to have as main properties to leverage cloud-platform services for reliable, scalable infrastructure and to scales horizontally, adding resources as demand increases and releasing resources as demand decreases. In particular, it upgrades without downtime and scales automatically using proactive and reactive actions. Some key design principles include: the use of non-blocking asynchronous communication, in a loosely coupled architecture, and handles transient failures without user experience degradation with node failures without downtime. Since the under lied architecture is based on cloud resources, the cloud native applications optimize the costs to run efficiently and without wasting resources. However, they are designed to using geographical distribution to minimize network latency and include monitors and application logs even as nodes come and go. Where did these characteristics come from? There is evidence that companies with a large web presence have clouds with some similar capabilities. As these characteristics show, an application does not need to support millions of users to benefit from cloud-native patterns. The architecture of the application makes a solution cloud-native, not the choice of platform. It is more cost-effective to architect new applications to be cloud-native from the start then transforming legacy applications. There is no need to for every application to be cloud- native. This is a business choice defined driven by technical insight. ZHAW ICCLab Contributors: Thomas Michael Bohnert, Andy Edmonds, Piyush Harsh, Cristof Marti, Sandro Brunner, Philipp Aeschlimann, Mathias Hablutzel, Sean Murphy, Vincenzo Pii, Diana-Maria Moise, Florian Dudouet. Please send an e-mail to cimm@zhaw.ch for commenting articles or suggesting topics for upcoming issues. FI-PPP Programme receives funding from the European Commission under the Seventh Framework Programme (FP7). The European Commission has no responsibility for the contents of this publication. This entry was posted in *. *, Articles, News by Antonio Cimmino. Bookmark the permalink.